This blog was created in efforts to bring a higher conscious of how the idea of sustainable living should be seen through a wider spectrum. Guerilla Gardeners This an interesting story that has been gaining more and more attention as of recently. Imagine guerillas running around the city, no not real guerillas but residents who decide to take the idea of gardening to another level. Residents all over the globe are pitching in to make a difference in their communities. The whole idea behind this guerilla gardening is to go out to areas of the city late at night and just plant shrubs, flowers, or trees in public spaces that are in need of some upkeep. All of the funds are either made by donation or out of their own pockets. I love this concept mainly because it is your own effort that you are putting forward and you really don't have to wait for approval from the city. There are hundreds of public spaces with in Philadelphia that could really use some Guerilla Gardeners to come in and help. Any one want to get it started ? On Sunday evening I took a ride around South Philadelphia, while I was riding I noticed that there are several community gardens all around Philadelphia. There are actual city run parks and then there are parks that are run by the community members themselves. As I passed by one community garden in particular on 19th and Federal. There were two people working in the garden as I passed by, and I thought to myself I have to go in and talk to them. 45 minutes later of good conversation with the residents I came out with a greater understanding of the community members and their struggle to stay in their own city. The woman's name was Catherine, she has been living in the area for all of her life. Her parents lived there before her, this was when the city was selling off lots of land for just a dollar. Catherine explains to me that she has been involved in her community garden, which now she owns and has named after her mother. (Theresa B. Vann) As our conversation grew I began to understand her frustration with the city. There are new buildings being built all around her while others are being tore down. I asked her what does she think should happen to the run-down buildings, she replies give the homeless a place to go. The city should fund these buildings so that the streets will start can start the process of a clean up. Catherine also explains to me how her rent has gone up by almost 20% over the past six months. She feels this is the cities way of basically forcing the lower income residents out of their homes. She once had neighbors all around her and now she explains some of them have moved out or are either homeless because of the raised prices. It is with the help of the city and the grassroots community members that a change will come. She tells me how she attends tons of council meetings, yet she feels as if they are doing no good. "The meetings are set up so that they(council members) can say later down the road they had the input of community members, even though the changes that were made do not involve their own ideas"
As I have mentioned before, the grassroots members of communities are the back-bone to the city. It is with their efforts that change is made in the city. Without them the upkeep of community gardens like Catherine's wont' be able to sell the produce that would have had been grown there. When I spoke to her about how she feels about the Green movement within Philadelphia she has several valid points that are not discussed, especially for communities that have parks with no actual upkeep. It takes just one small group of residents to speak up about the condition of their neighborhoods. This type of situation has occurred over the past few decades all over Philadelphia, yet there are still plenty of areas that have not spoke up yet. The mayor has proposed several green walks in Philadelphia in the up coming weeks, Catherine asks "how am I supposed to get there". Transportation is a big problem in Philadelphia. When the rail lines and Septa routes were planned out, they did not include some communities. This made it hard for residents to get where they needed to be. Also topsoil is given out for free up near the Horticultural Society, but you need to provide your own vehicle to transport the top soil. Something Catherine does not have. One major issue that Cathrine discussed with me was the fact that community members now are hiring their own lawyers to combat the city of Philadelphia. As mentioned earlier the taxes and rent payments are going up on homes, which is forcing residents out of their homes since they can't afford it. "Lawyers are not cheap" she says, "At what cost does it take to continue to live in Philadelphia for elder residents?" Catherine explains to me " we aren't stupid like they think". Thus meaning community members are not oblivious to how the city is transforming around them and how the new city plans do not necessarily include them. "All of the new walk and bike paths they want to build are great, but they are directing them to no where." If they keep tearing down buildings where will the trails and paths lead, and who will be there to use them is the question. She is not against the ideas of a greener Philadelphia, but she wants it to be included in the process. Catherine has been doing this in her own way by selling the vegetables she grows in her garden to community members, and it is this type of effort that will bring the city of Philadelphia back to what it once was. I have received the survey back that i spoke of in an early post. There were 3 rating questions (1-5), and two open ended question. 4)What would you want to see be changed in your park? 5) How important do you think parks are to an urban environment? For question one, 6 out of 17 people said they visit their park often. 7 though said that they never use their parks. The remaining votes fluctuated in between the two ends. A reason for the higher number of people not visiting their neighborhood parks could be that there is no real park around them. Many of the smaller community parks in different districts do not have proper upkeep. Asphalt is tore up on basketball courts and benches are turned in to make-shift beds for the hundreds of homeless on the streets. Very surprisingly though with question two 8 out of 17 stated their parks were clean, and 4 out of 17 saying that their park was pretty dirty (4). There was a 5 (meaning extremely dirty) along with a 3 (moderately dirty). This came to a surprise to me after seeing the results from question one. If the parks in their community are clean then how come they don't spend time there. I know the grass root community members are the back bone of the parks and public spaces, so why wouldn't they want to take advantage of their surroundings. With question three 10 out of 17 students said that they feel as if they have very little impact of their neighborhood park. 4 of them said though that they feel they have a large impact on their park. It is hard to say if the students recongnize the impact that they truly have just by either using the park or choosing not to use the park. Both I feel have a huge impact regardless of which you choose. By using the park, it would hopefully be in a positive way so that your input can create a favorable outcome. With not using your park you are having a negative impact, not utilizing all the resources of the park/public spaces in a positive way can leave the area empty and run down. The last two questions I chose to leave as open ended so that i could get some actual feedback from the class as to what they would want to see changed, along with how important they feel the parks are to the city. The majority of the answers for the first question were the idea of innolving the community more along with the youth. This can be done by more events that will cater to the youth, while bringing out the residents so that can communicate with one another about what they want to see be get acomplished in their community. A few others mentioned ideas of more jogging paths, better dog parks, and simply "clean it up". With in most urban communities you will find grass roots organizations that are the foundation of communities and have a direct influence upon them. It takes just one voice in a community to start a new way of thinking. As mentioned in the previous post Grays Ferry was an area of disregard. Similar to Grays Ferry a community in North Philadelphia had residents who spoke up and wanted to undo the years of disregard. 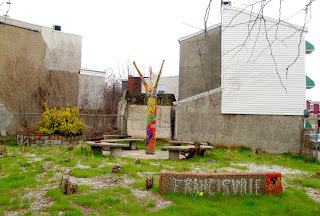 Residents of Francisville, Philadelphia were awarded a grant in 2007 from Wachovia Regional Foundation to residents along with other organizations to revamp the community of Francisville. This area was once a vibrant community that had several commercial corridors within its small area. Years of racial feuds destroyed the infrastructure and many of the buildings were not covered by insurance and were never rebuilt. This lead to years of neglect resulting in broken social and economic ties in the community. There are still many steps to go for this neighborhood to be where it once was, and it will take the efforts not just from the community members but political officials as well. All around Philadelphia there are hundreds of murals painted on walls. As noted in "Philadelphia murals and the stories the tell", early murals were first used for political activism. Years later it became a part of communities and gave residents "the plain folk" a chance to say what they wanted to see everyday. Although Philadelphia is credited for having the most amount of murals for a city, when I see most of them are located in areas where graffiti once stood and economic and social despair continues. The early forms of murals were strictly public art and not community art based. Most murals now will tell a story of the history of a community and members alike. Anit-graffiti movements are also involved but the focus of mural programs in Philadelphia remains based off of community outreach and encouragement programs. 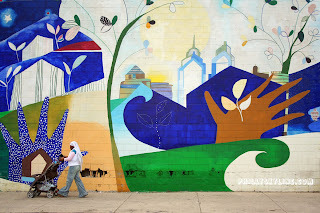 Areas like Grays Ferry where the "The Peace Wall" was painted following a racial charged altercation in 1997 that put a negative spotlight on the city of Philadelphia. The mural depicts guardian angels that look over the community. This area which is some times referred to as the "forgotten bottom". At that time there was also a number of housing projects that were deteriorating in the housing market and with suburbanization occurring. Some say that people are now beginning to move back to the city, which in turn would create a more diverse community. In 1919 the Bureau of Municipal Research in Philadelphia conducted a report that outlined the standards of living within Philadelphia. (Workingmen's Standard of Living in Philadelphia).There were over 200 families involved in this survey, all of them meeting certain requirements to be involved. The researchers estimated each family had five members; husband, wife, two boys and one girl. It was dated that in 1918 a family could not maintain a fair standard of living on less than $1,636.79 a year. When thinking about this in comparison to today's standard of living it is astonishing. Most researchers would say though since then the normal standard of living has increased ten-fold. Although this is true for many, the standard of living for the lower class has not changed at all. Since the push of suburbanization the people who have the better standard of living have moved out of the cities and on to their own lots of land. This has left many areas with numerous vacant buildings along with acres of unoccupied lots. These are the lots that will attract blight. Although some say that the suburbanization period is coming to an end and people are moving back in to the city, it is the areas that have been neglected the most that are still not receiving the influx of people or money. This is a form of social segregation that occurs daily within the city. It is clear from just walking around the city that a normal standard of living is much different now then it was back then. The richer stay rich and the poorer get poorer. Once a fair standard of living is maintained across the economic spectrum of all residents in Philadelphia, then neighborhoods will once again be revitalized. Just the other morning I caught the tail end of a great documentary Escape from Suburbia: Beyond the American Dream. There were several points that were brought up for the change that environmentalists seek when thinking about re-planning their own communities. One in particular is Willits, CA, this community has banded together to create a more sustainable community through both eco-villages, and other sustainable practices. The preservation of the community was sought out by the people and they did just that. A localized economy was built through supplying all of their own power. It was solutions like these that kept the community with its head above the rest. The majority of the actions that were implemented from grass roots groups in the community that wanted a change, and were not going to wait for others (Goverment) to do it for them. I am currenty a Temple Undergraduate and will be graduating this May. I am an Environmental Studies major with a minor in Geography and Urban Studies. This blog was created in effort to promote the idea of recycled art in the use of public use planning in urban environments.